In a previous article, I noted that the cost of utility-scale PV systems had fallen to close to US$1 per Watt_dc and—if historical trends hold true—could fall below US$0.50 per Watt_dc in five years. Several commentators rightly noted that a MWh of intermittent, unpredictable solar power should not be directly compared to a MWh of firm thermal power. So how much does firm solar power cost? This article uses Barbados (an island system that I know well) as the backdrop to explore two examples of high solar penetration: scaling PV to meet peak demand with thermal power for backup, and scaling PV to meet an entire day’s electricity consumption with the support of electricity storage. 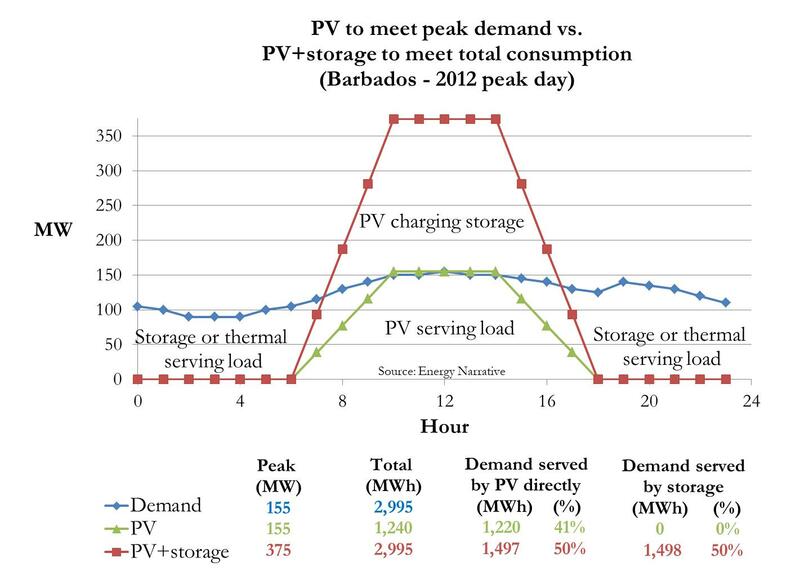 Figure 1 below shows Barbados’ hourly demand profile during 2012’s peak demand day (estimated from the Barbados Light & Power Integrated Resource Plan) in blue. I overlaid the two PV system options using a simplified solar generation profile: twelve hours of production, ramping from zero to full output in four hours, maintaining maximum output for four hours, and then ramping down to zero over four hours. This is optimistic – equal to a 33% utilization rate—and doesn’t account for clouds or other reductions from shading. The green profile is scaled to match peak demand (155 MW), while the red profile is scaled so that the area under the red curve equals the area under the blue curve (total electricity consumption for the day). In this idealized example, the PV system scaled to meet peak demand provides 41% of the day’s total electricity, and only 20 MWh (1.6%) of solar production is shed. The day’s flat demand profile during the hours of peak solar production helps to minimize wasted solar output. In a future report, I will look more closely at the implications of the load shape in systems with high solar penetration. 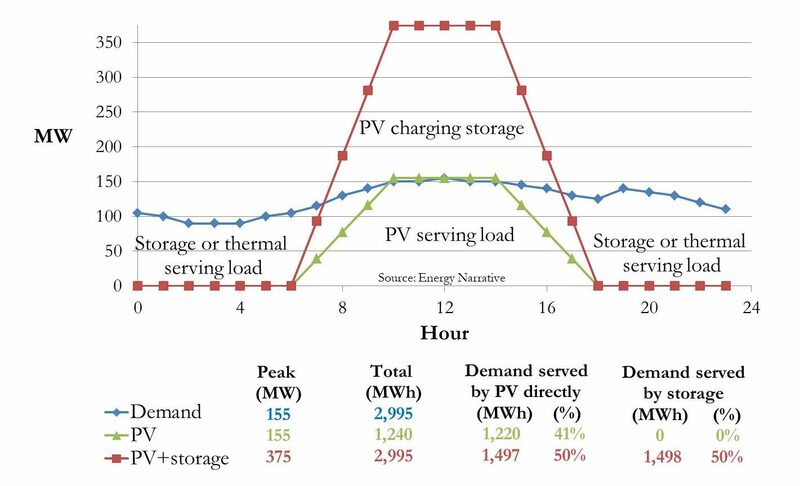 In order for solar to cover the entire day’s electricity consumption, total PV capacity must be nearly 2.5x peak demand (375 MW of PV compared to 155 MW peak demand). Half of the electricity that is produced serves the load directly and the other half is stored for night time use (the storage medium is assumed to have zero losses). Even in this idealized example, achieving 100% solar power would require a very large investment in PV and storage. 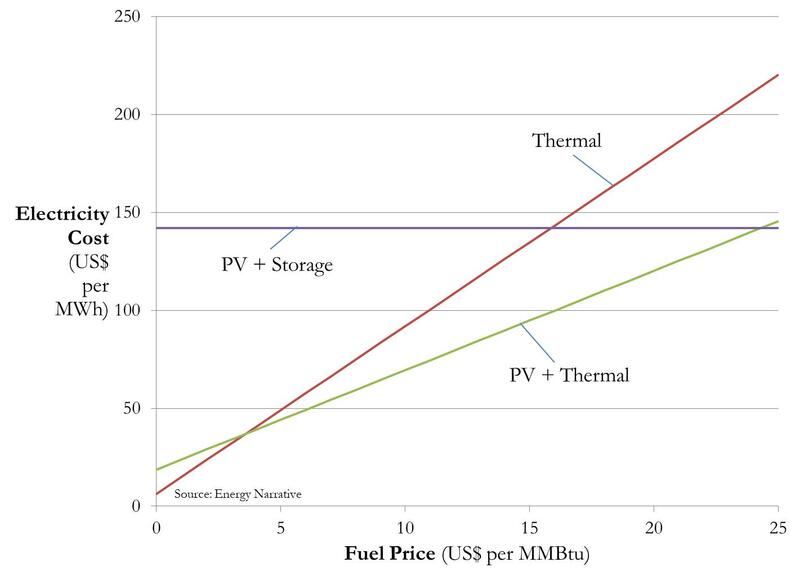 Figure 2 below compares the cost to generate electricity from the two options described above with a thermal power plant (modeled as an advanced internal combustion engine based on the EIA’s AEO 2017 operational parameters). I assumed PV costs were US$1,500 per kW delivered plus $18.50 per kW per year fixed O&M. I set storage costs at $252 per MWh delivered (not including the cost of the electricity to charge it), based on Lazard’s 2017 estimated levelized cost of storage for lithium-ion batteries. I then calculated the total cost of each option based on the share of total electricity supplied from each source during the day shown above. Unsurprisingly, thermal power is the most competitive only when the fuel is very cheap—in this example, less than US$4 per MMBtu. Natural gas can be delivered at less than that price in much of the U.S. (although not in Barbados), suggesting that utility scale PV prices are not yet low enough to fully compete with baseload thermal plants utilizing low cost natural gas on a firm supply basis. A future report will look into the optimal balance between PV and thermal plants for different thermal technologies. As fuel prices increase, the savings gained from solar power replacing thermal production become more substantial. Thermal backup continues to be more cost effective than storage, however, until fuel prices reach US$25 per MMBtu. This confirms the industry view that storage technologies are currently very cost effective for short term applications (such a frequency stability), but are more difficult to justify for more than four hours of storage duration.